It seems like every shoe made for a special occasion is designed to cause the maximum amount of pain. Maybe it’s just the style, but those killer heels that are absolutely to die for may feel like they’re actually going to kill you only halfway through the cocktail hour. Let’s be honest. The best part about a wedding is the reception and the best part about the reception is the dancing. It’s when family and friends of all ages can come together and express themselves and be silly. 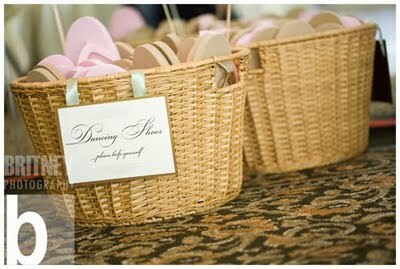 A great idea for Brides, is to set out a cute bucket or wicker basket filled with flip-flops or chinese slippers for your guests. You can have colors that match the colors of the wedding so guests still feel festive. 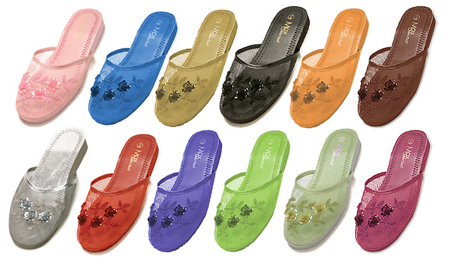 Make sure to tie each pair together so your guests don’t have to go hunting for the complimentary shoe. 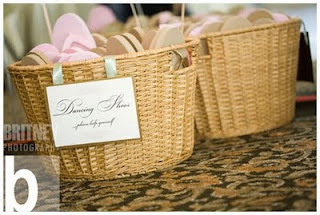 And at the end of the day, guests can take the flip-flops home as a wedding favor!